What does it mean to “float a horse’s teeth”? To float a horse’s teeth means to smooth or contour your horse’s teeth with a file (called a “float”). Unlike adult human teeth, horse teeth grow throughout their lifetime. Your horse’s teeth will develop sharp edges that may be painful and make it difficult to chew food or hold a bit. 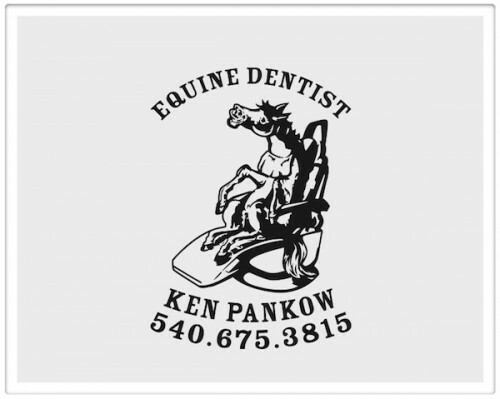 Most horses have all 36-44 permanent teeth by the age of five. Their front teeth cut hay and grass, while the top and bottom cheek teeth grind their food between the flat surfaces in a sideways motion. This grinding action breaks down the food into a pulp before swallowing, making it easier to digest. If your horse’s teeth surfaces are uneven, your horse will not be able to grind food for optimal digestion. Left untended, your horse’s upper cheek teeth will develop points toward the outside of the mouth next to your horse’s cheek. 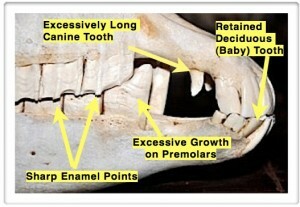 The bottom cheek teeth will develop points toward the inside of the mouth next to your horse’s tongue. These sharp points can then cut into the cheek and tongue making your horse uncomfortable. Just as routine dental check-ups contribute to the overall good health of your own teeth, horses also need regular dental check-ups to maintain their dental health. Horses that live in confined spaces and cannot graze all day are more prone to dental problems, because they are not naturally grinding their teeth all day to keep them smooth. Horses can develop other dental problems as well, such as excessively worn teeth, overbites, loose or broken teeth, or infected gums. Some horses will not exhibit any signs of dental problems, even when they do exist, so regular dental check-ups are still recommended to ensure your horse’s dental health. Having your horse’s teeth floated will help him digest his food better, keep him in better spirits, and make riding more enjoyable for you both. How Often Should a Horse’s Teeth Be Floated? There is no hard and fast rule for how frequently a horse’s teeth should be floated. Typically a young horse under the age of 5-6 should be checked twice a year. Older horses, age 6 and up, should be checked at least once a year. Frequency will depend on age, overall mouth condition and the amount of usage or demand that is asked of the horse. First, I request a loose halter be placed on your horse, with a lead rope attached. I then examine your horses teeth for sharp edges and I look for any abnormalities. I will then begin floating the upper edges of the horse’s teeth. When this is completed, I will then place a mouth speculum on your horse to keep your horse’s mouth open for floating the lower teeth. Your horse’s teeth are manually filed using a rasp in a back and forth motion to flatten the high points. The procedure is quick and painless, and usually takes only about 15 to 20 minutes to complete. Unlike humans, horse tooth nerves end close to the gumline, so there is no nerve where the tooth is being worked on; therefore your horse does not feel any nerve pain while his teeth are being floated.